Our recent release of the EBS Provisioned IOPS feature (blog post, explanatory video, EBS home page) has met with a very warm reception. 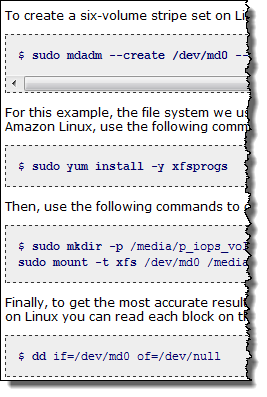 Developers all over the world are already making use of this important and powerful new EC2 feature. I would like to make you aware of some other new resources and blog posts to help you get the most from your EBS volumes. The EC2 FAQ includes answers to a number of important performance and architecture questions about Provisioned IOPS. Eric Hammond has written a detailed migraton guide to show you how to convert a running EC2 instance to an EBS-Optimized EC2 instance with Provisioned IOPS volumes. It is a very handy post, and it also shows off the power of programmatic infrastructure. I have been asked about the applicability of existing EC2 Reserved Instances to the new EBS-Optimized instances. Yes, they apply, and you pay only the additional hourly charge. Read our new FAQ entry to learn more. I have also been asked about the availability of EBS-Optimized instances for more instance types. We intend to support other instance types based on demand. Please feel free to let us know what you need by posting a comment on this blog or in the EC2 forum. The folks at CloudVertical have written a guide to understanding new AWS I/O options and costs. 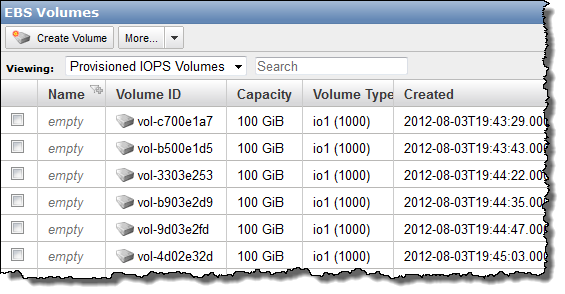 Creating Provisioned IOPS EBS volumes. Attaching the volumes to the instance. Creating a RAID from the volumes. Installing the appropriate benchmark tool. Benchmarking the I/O performance of your volumes. Deleting the volumnes and terminate the instance. Read the benchmarking guide to learn more about running the benchmarks and interpreting the results.